One of my close friends is a historical re-enactor, particularly of American Colonial French Militia. Through him, I’ve discovered a world where people dress in period-authentic garb. When I was a kid in New York, my dad took me to Governor’s Island, which was then a Coast Guard base. During the Bicentennial year of 1976, there were all sorts of American history activities all over the place, and being a true 13-year-old, I didn’t want anything to do with it, and I sure didn’t want to be dragged all around town by my dad. So here I am, 34 years older, traipsing around doing the things I didn’t want to do as a 13-year-old, camera in hand, just like the old man tried to teach me. Oh yeah, did I mention that Dad was an amateur photographer? True fact, that. 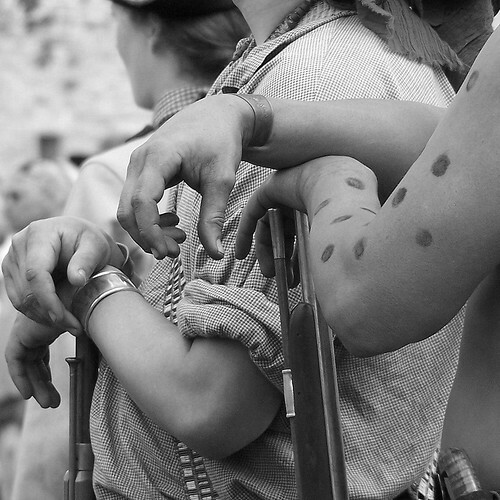 This photo was taken in June, at Fort de Chartres, at their Rendezvous. I like how easily these guys leaned on their rifles, as if they were natural extensions of themselves, comfortable and easy.